This name uses Portuguese naming customs. The first or maternal family name is de Sousa and the second or paternal family name is Saramago. José de Sousa Saramago, GColSE (Portuguese: [ʒuˈzɛ ðɨ ˈsozɐ sɐɾɐˈmaɣu]; 16 November 1922 – 18 June 2010), was a Portuguese writer and recipient of the 1998 Nobel Prize in Literature. His works, some of which can be seen as allegories, commonly present subversive perspectives on historic events, emphasizing the theopoetic human factor. In 2003 Harold Bloom described Saramago as "the most gifted novelist alive in the world today" and in 2010 said he considers Saramago to be "a permanent part of the Western canon", while James Wood praises "the distinctive tone to his fiction because he narrates his novels as if he were someone both wise and ignorant." Saramago was a founding member of the National Front for the Defense of Culture in Lisbon in 1992, and co-founder with Orhan Pamuk, of the European Writers' Parliament (EWP). Saramago was born in 1922 into a family of landless peasants in Azinhaga, Portugal, a small village in Ribatejo Province, some one hundred kilometers northeast of Lisbon. His parents were José de Sousa and Maria de Piedade. "Saramago", the Portuguese word for Raphanus raphanistrum (wild radish), was his father's family's nickname, and was accidentally incorporated into his name upon registration of his birth. In 1924, Saramago's family moved to Lisbon, where his father started working as a policeman. A few months after the family moved to the capital, his brother Francisco, older by two years, died. He spent vacations with his grandparents in Azinhaga. When his grandfather suffered a stroke and was to be taken to Lisbon for treatment, Saramago recalled, "He went into the yard of his house, where there were a few trees, fig trees, olive trees. And he went one by one, embracing the trees and crying, saying good-bye to them because he knew he would not return. To see this, to live this, if that doesn't mark you for the rest of your life," Saramago said, "you have no feeling." Although Saramago was a good pupil, his parents were unable to afford to keep him in grammar school, and instead moved him to a technical school at age 12. After graduating, he worked as a car mechanic for two years. Later he worked as a translator, then as a journalist. He was assistant editor of the newspaper Diário de Notícias, a position he had to leave after the democratic revolution in 1974. After a period of working as a translator he was able to support himself solely as a writer. Saramago married Ilda Reis in 1944. Their only daughter, Violante, was born in 1947. In 1986 he met Spanish journalist Pilar del Río. They married in 1988 and remained together until his death in June 2010. Del Río is the official translator of Saramago's books into Spanish. Saramago did not achieve widespread recognition and acclaim until he was sixty, with the publication of his fourth novel, Memorial do Convento. A baroque tale set during the Inquisition in 18th-century Lisbon, it tells of the love between a maimed soldier and a young clairvoyant, and of a renegade priest's heretical dream of flight. The novel's translation in 1988 as Baltasar and Blimunda (by Giovanni Pontiero) brought Saramago to the attention of an international readership. This novel won the Portuguese PEN Club Award. Saramago joined the Portuguese Communist Party in 1969 and remained a member until the end of his life. He was a self-confessed pessimist. His views aroused considerable controversy in Portugal, especially after the publication of The Gospel According to Jesus Christ. Members of the country's Catholic community were outraged by Saramago's representation of Jesus and particularly God as fallible, even cruel human beings. Portugal's conservative government, led by then-prime minister Cavaco Silva, did not allow Saramago's work to compete for the Aristeion Prize, arguing that it offended the Catholic community. As a result, Saramago and his wife moved to Lanzarote, an island in the Canaries. The European Writers' Parliament (EWP) came about as a result of a joint proposal by Saramago and fellow Nobel laureate Orhan Pamuk. Saramago was expected to speak as the guest of honour at the EWP, but he died before the opening ceremony in 2010. Saramago suffered from leukemia. He died on 18 June 2010, aged 87, having spent the last few years of his life in Lanzarote, Spain. His family said that he had breakfast and chatted with his wife and translator Pilar del Río on Friday morning, after which he started feeling unwell and died. The Guardian described him as "the finest Portuguese writer of his generation", while Fernanda Eberstadt of The New York Times said he was "known almost as much for his unfaltering Communism as for his fiction". Saramago's translator, Margaret Jull Costa, paid tribute to him, describing his "wonderful imagination" and calling him "the greatest contemporary Portuguese writer". Saramago had continued his writing until his death. His most recent publication, Claraboia, was published in 2011, after his death. Saramago had suffered from pneumonia a year before his death. Having been thought to have made a full recovery, he had been scheduled to attend the Edinburgh International Book Festival in August 2010. Portugal declared two days of mourning. There were tributes from senior international politicians: Luiz Inácio Lula da Silva (Brazil), Bernard Kouchner (France) and José Luis Rodríguez Zapatero (Spain), while Cuba's Raúl and Fidel Castro sent flowers. Saramago's funeral was held in Lisbon on 20 June 2010, in the presence of more than 20,000 people, many of whom had travelled hundreds of kilometres, but also notably in the absence of right-wing President of Portugal Aníbal Cavaco Silva, who was holidaying in the Azores as the ceremony took place. 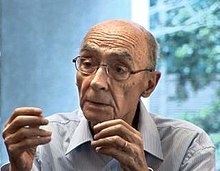 Cavaco Silva, the Prime Minister who removed Saramago's work from the shortlist of the Aristeion Prize, said he did not attend Saramago's funeral because he "had never had the privilege to know him". Mourners, who questioned Cavaco Silva's absence in the presence of reporters, held copies of the red carnation, symbolic of Portugal's democratic revolution. 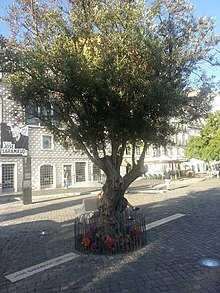 Saramago's cremation took place in Lisbon, and his ashes were buried on the anniversary of his death, 18 June 2011, underneath a hundred year old olive tree on the square in front of the José Saramago Foundation (Casa dos Bicos). The José Saramago Foundation announced in October 2011 the publication of a so-called "lost novel" published as Skylight (Claraboia in Portuguese). It was written in the 1950s and remained in the archive of a publisher to whom the manuscript had been sent. Saramago remained silent about the work up to his death. The book has been translated into several languages. Saramago's experimental style often features long sentences, at times more than a page long. He used periods sparingly, choosing instead a loose flow of clauses joined by commas. Many of his paragraphs extend for pages without pausing for dialogue, (which Saramago chooses not to delimit by quotation marks); when the speaker changes, Saramago capitalizes the first letter of the new speaker's clause. His works often refer to his other works. In his novel Blindness, Saramago completely abandons the use of proper nouns, instead referring to characters simply by some unique characteristic, an example of his style reflecting the recurring themes of identity and meaning found throughout his work. Saramago's novels often deal with fantastic scenarios. In his 1986 novel The Stone Raft, the Iberian Peninsula breaks off from the rest of Europe and sails around the Atlantic Ocean. In his 1995 novel Blindness, an entire unnamed country is stricken with a mysterious plague of "white blindness". In his 1984 novel The Year of the Death of Ricardo Reis (which won the PEN Award and the Independent Foreign Fiction Award), Fernando Pessoa's heteronym survives for a year after the poet himself dies. Additionally, his novel Death with Interruptions (also translated as Death at Intervals) takes place in a country in which, suddenly, nobody dies, and concerns, in part, the spiritual and political implications of the event, although the book ultimately moves from a synoptic to a more personal perspective. Saramago addresses serious matters with empathy for the human condition and for the isolation of contemporary urban life. His characters struggle with their need to connect with one another, form relations and bond as a community, and also with their need for individuality, and to find meaning and dignity outside of political and economic structures. When asked to describe his daily writing routine in 2009, Saramago responded, "I write two pages. And then I read and read and read." Saramago was an atheist. The Catholic Church criticised him on numerous occasions due to the content of some of his novels, mainly The Gospel According to Jesus Christ and Cain, in which he uses satire and biblical quotations to present the figure of God in a comical way. The Portuguese government lambasted his 1991 novel O Evangelho Segundo Jesus Cristo (The Gospel according to Jesus Christ) and struck the writer's name from nominees for the European Literature Prize, saying the atheist work offended Portuguese Catholic convictions. The book portrays a Christ who, subject to human desires, lives with Mary Magdalene and tries to back out of the crucifixion. Following the Swedish Academy's decision to present Saramago with the Nobel Prize in Literature, the Vatican questioned the decision on political grounds, though gave no comment on the aesthetic or literary components of Saramago's work. Saramago responded: "The Vatican is easily scandalized, especially by people from outside. They should just focus on their prayers and leave people in peace. I respect those who believe, but I have no respect for the institution." Saramago was a proponent of anarcho-communism,[not in citation given] and a member of the Communist Party of Portugal, however, in his: 'Lanzarote Notebook 1', José Saramago cites a comment by Gabriel García Márquez, during a meeting in Santiago de Compostela, called by Manuel Fraga: 'You the Stalinist don't believe in reality'. As such 'communist' he stood for the 1989 Lisbon local election in the list of the Coalition "For Lisbon" and was elected alderman and presiding officer of the Municipal Assembly of Lisbon. Saramago was also a candidate of the Democratic Unity Coalition in all elections to the European Parliament from 1989 to 2009, though was often in positions thought to have no possibility of being elected. He was a critic of European Union (EU) and International Monetary Fund (IMF) policies. Although many of his novels are acknowledged political satire of a subtle kind, it is in The Notebook that Saramago made his political convictions most clear. The book, written from a Marxist perspective, is a collection of his blog articles for the year September 2008 to August 2009. According to The Independent, "Saramago aims to cut through the web of 'organized lies' surrounding humanity, and to convince readers by delivering his opinions in a relentless series of unadorned, knock-down prose blows." His political engagement led to comparisons with George Orwell: "Orwell's hostility to the British Empire runs parallel to Saramago's latter-day crusade against empire in the shape of globalisation." When speaking to The Observer in 2006 he said "The painter paints, the musician makes music, the novelist writes novels. But I believe that we all have some influence, not because of the fact that one is an artist, but because we are citizens. As citizens, we all have an obligation to intervene and become involved, it's the citizen who changes things. I can't imagine myself outside any kind of social or political involvement." During the Second Intifada, while visiting Ramallah in March 2002, Saramago said: "What is happening in Palestine is a crime we can put on the same plain as what happened at Auschwitz ... A sense of impunity characterises the Israeli people and its army. They have turned into rentiers of the Holocaust." Some critics of these words contended that they were antisemitic. Six months later, Saramago clarified. "To have said that Israel's action is to be condemned, that war crimes are being perpetrated - really the Israelis are used to that. It doesn't bother them. But there are certain words they can't stand. And to say 'Auschwitz' there ... note well, I didn't say that Ramallah was the same as Auschwitz, that would be stupid. What I said was that the spirit of Auschwitz was present in Ramallah. We were eight writers. They all made condemning statements, Wole Soyinka, Breyten Breytenbach, Vincenzo Consolo and others. But the Israelis weren't bothered about those. It was the fact that I put my finger in the Auschwitz wound that made them jump." During the 2006 Lebanon War, Saramago joined Tariq Ali, John Berger, Noam Chomsky, and others in condemning what they characterized as "a long-term military, economic and geographic practice whose political aim is nothing less than the liquidation of the Palestinian nation". He was also a supporter of Iberian Federalism. In a 2008 press conference for the filming of Blindness he asked, in reference to the Great Recession, "Where was all that money poured on markets? Very tight and well kept; then suddenly it appears to save what? lives? no, banks." He added, "Marx was never so right as now", and predicted "the worst is still to come." The Swedish Academy selected Saramago as 1998 recipient of the Nobel Prize for Literature. The announcement came when he was about to fly to Germany for the Frankfurt Book Fair, and caught both him and his editor by surprise. The Nobel committee praised his "parables sustained by imagination, compassion and irony", and his "modern skepticism" about official truths. The José Saramago Foundation was founded by José Saramago in June 2007, with the aim to defend and spread the Universal Declaration of Human Rights, the promotion of culture in Portugal just like in all the countries, and protection of the environment. The José Saramago Foundation is located in the historic Casa dos Bicos in the city of Lisbon. "Saramago, José (1922–2010)." Encyclopedia of World Biography. Ed. Tracie Ratiner. Vol. 25. 2nd ed. Detroit: Thomson Gale, 2005. Discovering Collection. Thomson Gale. University of Guelph. 25 Sep. 2007. 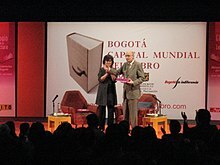 Wikimedia Commons has media related to José Saramago. ^ Bloom, Harold (2003). Genius: A Mosaic of One Hundred Exemplary Creative Minds. New York: Warner Books. ISBN 0-446-52717-3. ^ Bloom, Harold (15 December 2010). "Fond Farewells". TIME. Retrieved 15 December 2010. ^ a b c Evans, Julian (28 December 2002). "The militant magician". The Guardian. Retrieved 28 December 2002. ^ a b Eberstadt, Fernanda (18 June 2010). "José Saramago, Nobel Prize-Winning Writer, Dies". The New York Times. Retrieved 18 June 2010. ^ a b "Nobel Writer, A Communist, Defends Work". The New York Times. 12 October 1998. Retrieved 18 June 2010. ^ a b c d "Portugal mourns as Nobel laureate's body returned". The China Post. 21 June 2010. Retrieved 21 June 2010. ^ a b c d "President defends Jose Saramago funeral no-show". BBC News. 21 June 2010. Retrieved 21 June 2010. ^ a b c d e f g h i j k Quoted in: Eberstadt, Fernanda (26 August 2007). "The Unexpected Fantasist". The New York Times. Retrieved 14 August 2009. ^ a b Jaggi, Maya (22 November 2008). "New ways of seeing". The Guardian. London. Retrieved 22 November 2008. ^ "Nobel Prize citation, 1998". Nobelprize.org. Retrieved 2010-06-20. ^ Langer, Adam (November–December 2002). "José Saramago: Prophet of Doom - Pessimism is our only hope. The gospel according to José Saramago". Book Magazine. Web.archive.org. Archived from the original on 2002-10-31. Retrieved 2010-06-20. ^ Paige, Austin (Spring 2004). "Shadows on the Wall: Jose Saramago's latest novel depicts a capitalist nightmare". The Yale Review of Books. Yalereviewofbooks.com. Archived from the original on 2010-09-01. Retrieved 2010-06-20. ^ "José Saramago: Autobiography". Nobelprize.org. 1998. Retrieved 2010-06-20. ^ Wall, William (1 December 2010). "The Complexity of Others: The Istanbul Declaration of The European Writers' Conference". Irish Left Review. Retrieved 1 December 2010. ^ a b c d Lea, Richard (18 June 2010). "Nobel laureate José Saramago dies, aged 87". The Guardian. London. Retrieved 18 June 2010. ^ "Nobel-wiining[sic] novelist Saramago dies aged 87". The Hindu. Chennai. 18 June 2010. Retrieved 18 June 2010. ^ a b c "Portuguese Nobel laureate Saramago's funeral held". Xinhua News Agency. 21 June 2010. Archived from the original on 23 June 2010. Retrieved 21 June 2010. ^ "Claraboya, novela inédita de Saramago, verá la luz". El País. 3 October 2011. Retrieved 14 October 2011. ^ Maloney, Evan (4 March 2010). "The best advice for writers? Read". The Guardian. London. Retrieved 4 March 2010. ^ Nash, Elizabeth (9 October 1998). "Saramago the atheist, an outsider in his own land". The Independent. London. ^ a b "Communist Party of Portugal: Short Biographical note on José Saramago". Pcp.pt. Archived from the original on 2012-03-07. Retrieved 2012-06-15. ^ Wright, Thomas (4 April 2010). "The Notebook by José Saramago: The Nobel laureate's blog entries burn with passion". The Independent. Retrieved 4 April 2010. ^ Rollason, Christopher (2006). "How totalitarianism begins at home: Saramago and Orwell" (PDF). ^ Meritt, Stephanie (30 April 2006). "Interview: Still a street-fighting man". The Observer. Retrieved 30 April 2006. ^ De las piedras de David a los tanques de Goliat by José Saramago, El País 21/Abril/2002 (in Spanish). ^ "Bigotry in Print. Crowds Chant Murder. Something's Changed" Archived 2010-01-12 at the Wayback Machine by Paul Berman, The Forward (available online here) May 24, 2002. ^ "Israel, Lebanon, and Palestine: Tariq Ali, John Berger, Noam Chomsky, Eduardo Galeano, Naomi Klein, Harold Pinter, Arundhati Roy, José Saramago & Howard Zinn". 19 July 2006. ^ "Karl Marx was never so right, says Nobel laureate Saramago". MercoPress (Quote here is based on the source heading; there appears to be a typing error in the source text.). 28 October 2008. Retrieved 28 October 2008. ^ Folha Online (31 May 2009). "Prêmio São Paulo de Literatura divulga finalistas". Folha de S.Paulo. Retrieved 6 April 2013. ^ a b "Cidadãos Nacionais Agraciados com Ordens Portuguesas". Página Oficial das Ordens Honoríficas Portuguesas. Retrieved 31 July 2017. Donzelina Barroso (Winter 1998). "Jose Saramago, The Art of Fiction No. 155". The Paris Review. This page was last edited on 23 March 2019, at 19:51 (UTC).